Saving Bees? Feed them. Plan for flowering plants from early spring until mid-fall. Don’t use any pesticides. Then you don’t have to try to figure out if the claim that it won’t harm bees is true or not. 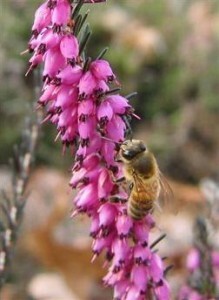 Winter flowers feed bees. 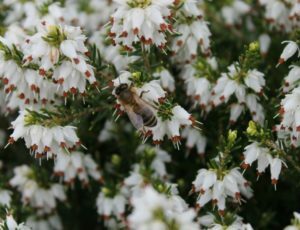 It’s easier to provide flowers for bees in our cool early springs than you might think. What we are learning about saving bees can be made very simple. Feed them! Use a diverse plant palette with flowers from early spring until mid-fall. Don’t use any pesticides and then you don’t have to try to figure out what is safe and what isn’t or who to trust. I have always found summer easy to provide a diverse collection of flowers for all kinds of bees but early spring requires thought and planning. My beach house landscape on the Olympic Peninsula is a great example of a very low maintenance and bee friendly garden. 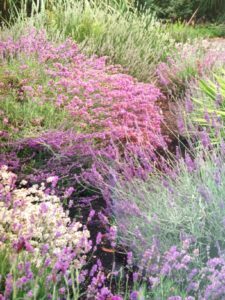 The plants I list in this article are from my experiences there and from my landscape design practice here in Portland, Oregon. Foliage goes to a whiskey color with flecks of orange in the cold, the flowers are a strong purple red and best of all it’s only 4 inches high. It spreads to about 16” wide January to May. 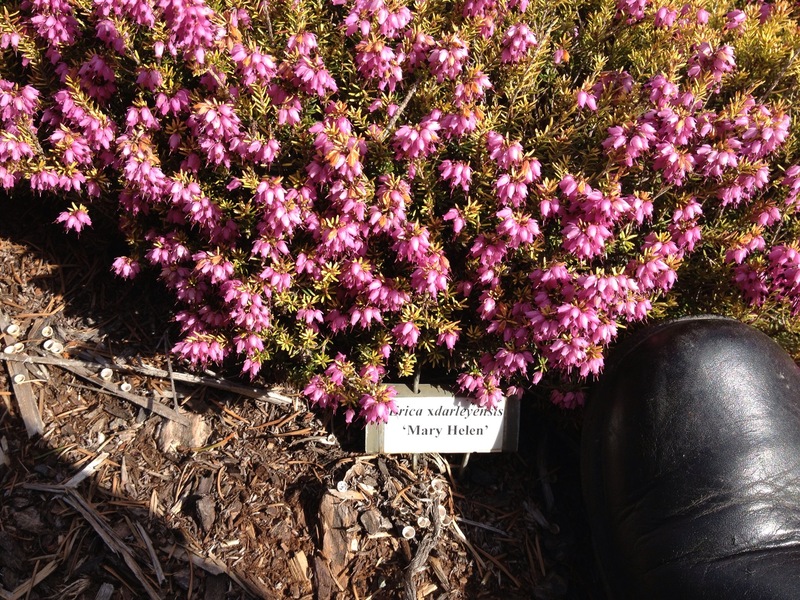 This short compact plant is unusual among the spring heather, most are 6 to 8 inches high. Clean dark green foliage with Cabernet red flowers – 8” high and spreading to 18” November to April. Has a strong violet purple flower and is more compact than typical, 6” high by 18” spread. It flowers later than Bells Extra Special. I like to put these two together for foliage contrast. Sports an interesting gold bronze foliage in winter and lots of flower power in February to April. 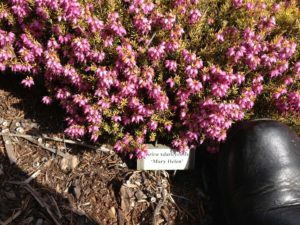 These plants are grown locally by Highland Heathers in Canby, Oregon. This grower supplies retail nurseries, special plant sales such as HPSO Hortlandia spring plant sale and you can buy directly if you make an appointment. You won’t find these varieties at a big box store. The common varieties get too big for most landscape situations and then you end up hacking at them and then they are ugly and out they go. A lot of my other early spring flowering plants are Pacific NW natives. Rubus spectabilis, Salmon Berry, has a spectacular colorful spring flower with 75 to 100 stamens which will keep bees busy for a long time. This flower calls the early bumble bees by the droves. This shrub has thorns and needs a bit of room so think first and plant second. Our Oregon grape, Mahonia aquifolium, my evergreen huckleberry, Vaccinium ovatum, and the hot pink red flowering current edge the light woods around the house and provide for the various local bees. Some people don’t like Oregon grape because the leaves can get winter damage and have ratty looking leaves by early spring. I say no problem, let them flower to provide for wildlife and then cut them down to the ground. They will re leaf into glossy and good looking foliage for the rest of the year. We know English lavender is great for bees in the summer. Like heather, all lavender has hundreds of tiny flowers and is an abundant source for nectar. 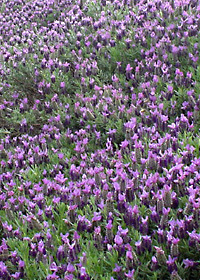 Spanish lavender flowers much earlier than English lavender and provides for mid spring to early summer nectar. We need good drainage to be successful with with Spanish lavender but this often just means mounding up a few inches. Don’t over water Spanish lavender. I water mine once a month and am not sure it even needs that now that the plants are old. ‘Winter Bee’ PP #20,840.Up at my vacation house my Spanish lavender flowers in early April to mid summer. I have seen flowers on them in March. After the main flowering, I cut it back about 1/3rd and get another lovely hit of flowers in late summer into early fall. Here are three spring flowering Spanish lavender varieties I have grown: ‘Blueberry Ruffles‘, ‘Hazel, and ‘Mulberry Ruffle’s‘. Blooming Nursery sells to many of the larger garden centers but don’t look for their plants at a box store; they won’t be there. 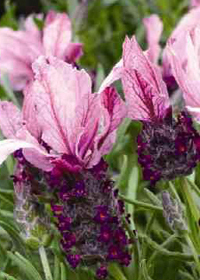 This unusual variety, ‘Mulberry Ruffles’, is compact and flowers earlier than most Spanish lavender. Last of all, the best early flower for bees at our beach property isn’t what you would think of as a flower probably. It has to be the huge old Oregon Big Leaf Maples down at the edge of the beach. When they flower, the sound of bees is a low roar, I am not kidding. My grandkids are a little nervous and tend to stay out of that area for a while. Bees will earn respect if need be but otherwise I find them easy to get along with. I do flinch when a bumble bee takes a dead run at me… and then I scold them for being bossy. There is enough room in the garden for everyone.